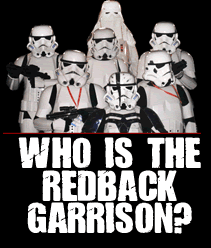 The Redback Garrison attended this years Annual 4KQ Children’s Christmas Party. It’s always a favorite for all of our troopers, as we get so many enthusiastic kids and parents wanting to share the simple fun of Star Wars! This year, we had a huge turn out, even escorted into the event by the Queensland Police band! After the event was finished, and all the weary mums, dads, and kids went home – we got this lovely letter thanking us for attending. This makes all the armour-bites, all the sweaty undersuits, and all the blisters so worth while. n impact you have on children like mine, but you literally made his day. It was truly a dream come true, and something I could never give him. For you all to stay in costume, through the stifling heat, and still be dancing to the music and posing for endless photos, well you deserve a medal. I am even teary as i write this, because you gave us an experience will never forget. As hard as it is to be a parent to a child with difficulties, yesterday made it all worth it. I just cannot thank you all enough, from the bottom of my heart. You are all wonderul. We will be watching your FB site for future appearances from now on. Please pass on my thanks to all those in costume, and feel good knowing how much you meant to my little boy, not to mention the other thousands of children who attended. You are special people. … and that is why we do what we do! This entry was posted on Monday, December 3rd, 2012 at 9:29 pm	and is filed under Uncategorized. You can follow any responses to this entry through the RSS 2.0 feed. Both comments and pings are currently closed.